Acclaimed Americana/Blues guitarist William Lee Ellis was raised in the deep roots of American music. Named after his godfather, legendary bluegrass pioneer Bill Monroe, Ellis grew up in a musical family - his father, Tony Ellis, was one of Monroe's Blue Grass Boys. Growing up in Kingsport, Tennessee was as close to bluegrass heaven as you could get - some of William Lee's earliest memories include trips to Appalachian musician Tommy Jarrell's home with his father, and being bounced on his godfather's knee. It was only natural for him to take up the guitar, and Ellis spent his adolescence backing his fiddle-and-banjo-playing dad at bluegrass festivals and contests across the country. In college, Ellis took his musical studies in a new direction, spending the better part of a decade playing classical guitar and earning a master's degree in classical performance from the University of Cincinnati-College Conservatory of Music (CCM). While there, Ellis chanced upon a musician who would change his life: Piedmont blues giant Reverend Gary Davis. Folk-blues revivalist Andy Cohen introduced Ellis to Davis's intricate finger-picking style, which fascinated the classically-trained guitarist. "Davis was a great sacred bluesman, and that's a genre I love dearly," Ellis says. "There's combination of the heavenly and the hellish, there are wonderful dynamics… tension and drama." His discovery led Ellis to other bluesmen - Blind Blake, Lonnie Johnson, Blind Willie Johnson, and Willie McTell. Soon, Ellis had a band of his own, the Midnight Steppers, an acoustic Delta/jug band/rockabilly group that included longtime collaborator and compadre Larry Nager. In the late '80s, the Steppers performed regionally at festivals and on such national radio and TV programs as NPR's Mountain Stage and TNN's Nashville Now. 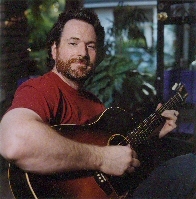 Along the way, Ellis learned to combine Davis's finger-picking technique with his classical performance background and the bluegrass-infused memories of his youth. Yet it's clear that he's no revivalist - Ellis writes his own unique music, using old blues forms as a vocabulary to express his contemporary experiences. In his quest to capture the timeless appeal of pre-war blues, and to make the music's message live for today, Ellis has created a new style of Americana / roots music - one that's all his own. With three albums under his belt (1987's Righteous Blues; Preachin' in That Wilderness, a '92 collaboration with Andy Cohen and Eleanor Ellis; and 2000's The Full Catastrophe, an album hailed by the international press from Billboard to the London Times), Ellis entered the recording studio in mid-2002 to record his finest record to date - Conqueroo. Accompanied by longtime pal Larry Nager, Memphis soul group the Masqueraders, vocalists Susan Marshall and Reba Russell, and his father, William Lee Ellis laid out 13 elegant, eloquent tunes, ranging from the soulful ("How the Mighty Have Fallen") to the heartfelt ("King of the Mountain"), while touching on every emotion in between. On Conqueroo, Ellis is the vanquisher, the gentle master in control of his own musical destiny. It's fitting that Ellis's current home is Memphis, Tennessee, the birthplace of the blues. Kingsport, across the state, still boasts some of the best bluegrass musicians performing today. And, in between the two cities, there's Nashville - the state capitol, and the home of country music. As exemplified by Conqueroo, William Lee Ellis's music draws from all three.